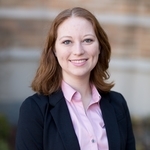 Rebecca is a third year doctoral student in the department of Chemistry and Biochemistry at Notre Dame. She graduated from the University of Miami with a bachelor’s degree in Chemistry in 2016. Her research revolves around all-inorganic lead halide perovskites. Her current work focuses on the physical transformations of bulk perovskite films, interfacial interactions between perovskites and charge transport layers, and utilizing novel nanostructures to enhance photoconversion efficiency. 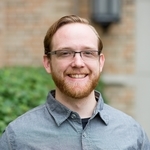 Jeff is a second year doctoral student in the department of Chemistry and Biochemistry at Notre Dame. He graduated with a bachelors in Material Science & Engineering from the University of Arizona in 2017. Jeff's current research is focused on the effects of surface modifications to CsPbBr3 perovskite nanocrystals and how it impacts electron / energy transfer. 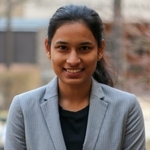 Preethi is a first year doctoral student in the Department of Chemistry and Biochemistry at Notre Dame. She graduated from the Indian Institute of Science Education and Research (IISER-TVM) with a Masters’ degree in Chemistry in 2018. Preethi’s current research is focused on understanding halide ion segregation in mixed halide perovskite thin films.